Clogged drains are a common plumbing issue. But not all clogs are created equal, and the ways in which to clean your drain without damaging it depend on many factors. Chemical products and a variety of tools are available to help keep your home’s drains clean. But some products aren’t always effective, which can lead to further issues. Also, using the right tools the wrong way can cause unwanted damage that requires additional repairs. The following are five tips for cleaning your drain without damaging it while improving the performance of your home’s plumbing. The most basic cleaning strategy consists of using hot water. Flushing your plumbing with hot water can help break debris free and allow your drains to restore their function. The various materials that can build up in your drains can be removed through the use of hot water and pressure. Some drains may require up to 15 minutes of exposure to hot water in order to be cleaned. If this strategy doesn’t fully clean your drain, you can move on to other safe options. A common household plunger helps you clean your drain easily and without damage. Plungers are available in a variety of sizes and designs to meet your needs, making it easy to clean the toilet, bathtub, and sink drains. To clear your drain, place the plunger over the opening and use firm pressure to push up and down. Keep the movement steady while avoiding the use of too much force. Overflow vents are common on many sinks and should be covered when using a plunger. Homemade drain cleaners can be useful when cleaning your drain. Baking soda is an ideal alternative to costly and potentially harmful chemical agents. It can be mixed with salt and cream of tartar and poured into your drain. Rinse the solution with hot water and repeat as needed. This can help you break up any debris or grease in your drainpipes and allow them to return to optimal performance. Although commonly used by professional plumbers, drain snakes are available at many home repair stores for homeowners to use. Using a drain snake is relatively simple, but it must be done correctly to ensure the best results and prevent damage. Drain snakes are led into drainpipes through the use of a rotating handle. Once the snake comes into contact with the debris that’s causing the blockage, the snake can manipulate it and clear the drain pipe. Pulling the drain snake back out of the pipe removes the debris and restores its function. Your pipes may need to be removed for proper cleaning. PVC pipes can be easily removed, which allows you to clear any blockage and avoid costly repairs. But if you have difficulty removing a pipe or aren’t sure how to do it, then you might need the assistance of a professional plumbing service. These are some simple ways to clean your drain without damaging it. These strategies can help in many common situations, but more advanced issues may require a professional plumber to avoid costly damage. 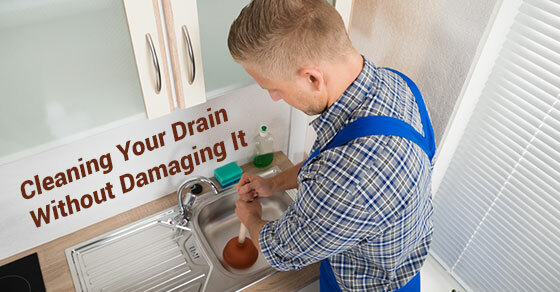 Keeping your drain clean and free from debris will prevent unwanted issues that could cause additional repairs.